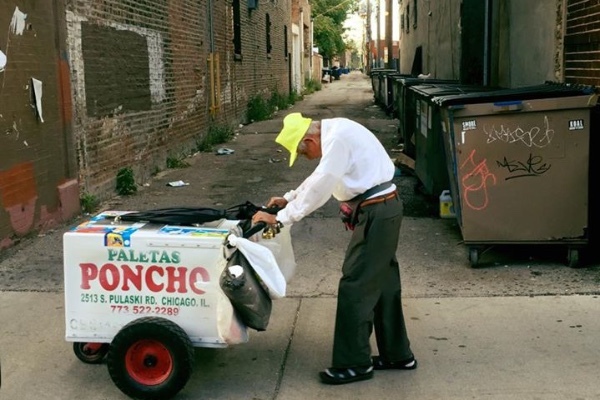 A GoFundMe campaign for an elderly paleta street vendor from Little Village has gone viral. Joel Cervantes Macias witnessed Fedencio Sanchez hunched over and struggling to push his paleta cart down 26th Street in the Little Village neighborhood of Chicago. “It broke my heart seeing this man that should be enjoying retirement still working at this age,” explained Macias in his campaign story. He snapped a photo of the man and shared the experience on Facebook. The enormous response to the photo inspired the idea for the campaign. Macias discovered that Sanchez and his wife, who also sold paletas until becoming ill, recently lost their only daughter and main support system. The GoFundMe goal was set at $3,000. It has since reached $13,000 in 4 hours. “I’m just humbled and overwhelmed with all the incredible kindness from all the people of not only Little Village but nationwide,” Macias expressed to Gozamos. He plans on delivering the check to Fidencio on Monday and is currently talking to Univision about taping the event.